It was an exciting period for the label with creative energy and can-do attitudes being dispersed from the halls of the soul music giant. These developments were a long time aspiration of Jim Stewart. Having seen the phenomenal growth of what a southern rock label like Capricorn Records had accomplished, Stewart's objective was to cash-in on the album market. With singles (45 RPM's) on the decline, he wanted to parallel what Otis Redding's former manager, Phil Walden, had accomplished with Capricorn. As these goals were being met, Stewart then recruited Phillip Rauls to the label for his expertise in Pop Music. This opportunity was perfect for Phillip as he was being reunited with former associates Stewart, Larry Raspberry and Don Nix. "People frequently asked me why I would leave a cushy job with Atlantic Records living in beautiful Miami and move to Memphis for a start-up position" said Phillip. "That's when I would respond by saying...There weren't any good Bar-B-Q restaurants in Miami." STAX's executive offices were moved from the McLemore Ave. studio and relocated into the newly acquired administrative facilities that previously housed a large church congregation. How could the label's expansion program go wrong by moving upon blessed grounds? 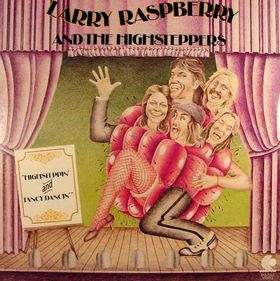 There were a lot of moving parts banking on the key signing of Larry Raspberry and The Highsteppers. The band was the hottest new act and packing'em in like sardines at the local nightclubs. This activity earned key media respect which would transend into airplay. Raspberry, aka "The Razz," was a veteran entertainer who had previously experienced chart success as the leader of The Gentrys. Plus, he'd shared a label stint with Phillip at Atlantic as a recording artist both with the rock group Alamo and also as a solo act. 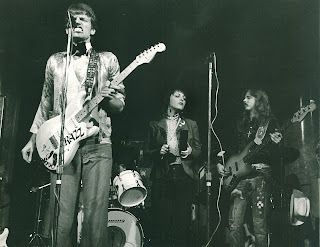 Pictured above are several Highsteppers members featuring Raspberry on guitar, Carol Ferante, the former Miss Tennessee in center, and bassist Rocky Bretta. 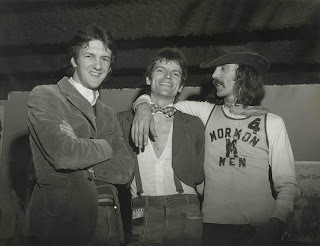 Phillip Rauls, Larry Raspberry and producer Don Nix pose for a STAX press shot at the heralded nightclub Lafayette's Music Room located in Overton Square in Memphis. Indivdually and collectively, this talented trio would serve as a integral part of the Memphis Music landscape spanning over three decades. "Highsteppin' and Fancy Dancin" was the title of this pivotal release for the label. Nationwide the album received substantial airplay featuring songs such as; "Jive Asp, Fool in Sheep Clothing, Dixie Diner," and the single from the album, "Rock & Roll Warning." 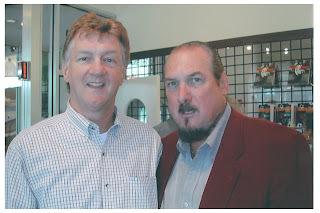 Two former STAX guys reunite and share smiles in Memphis in 2003. 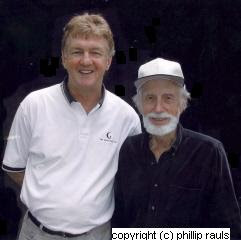 Jim Stewart (R) co-founder of STAX Records and former label exec Phillip Rauls (L) pose for a photograph at Stewart's residence. More about this visit and Stewart's legacy later in this posting. It wasn't too long ago when I returned to Memphis to attend the Grand Opening of the STAX Museum of American Soul Music and the STAX Music Academy. The occasion was a week's long celebration of events with various functions taking place practically every day and night. I didn't quite know what to expect being so far-removed from Soulsville USA and transplanted years ago in the Pacific Northwest. When you stop and think about the amount of time that has elapsed since my involvement with the company, the doors of STAX Records has been closed since 1976 and who knows how many artists and fellow employees are still among us. But my suspense would soon be lifted as the next few days would reveal. As my story begins, the long flight from Seattle darn-near took all day. However, upon my arrival in Memphis, I was ready to pull-out my favorite STAX 45 RPM's and party with my former colleagues. 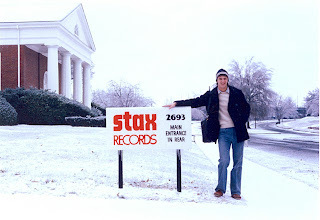 On my first night I couldn't resist driving past the old STAX facilities on McLemore Avenue to view the changes. That's when I noticed a flurry of activities in-and-around the new building and stopped to investigate. Surprisingly, the Museum Souvenir Shop was open for business. I entered the facilities only to come face-to-face with old friend and associate, the legendary Steve Cropper. What a beautiful sight for my sore eyes. I had no idea if he was committed to the week long event. But there he was...Blues Brother pony tail and all. After a brief reunion of bear-hugs and sharp digs at each other's expanded waist lines, I felt right at home in the work place of my former employer. Visiting with Cropper on my first day was well worth the long journey. Phillip Rauls and Steve Cropper reconnect for the first time since 1986. The following evening Issac Hayes hosted a private party at his new restaurant that was attended by many celebrities and politicians. Hayes made a grand appearance midway through the party supported by the blinding effects of hundreds of flash bulbs. Plus the Mayor of Memphis were there, David Porter showed up, and old friend Marvell Thomas was there, plus original member of The Bar-Kays, James Alexander attended (pictured below). Who knew what surprises were ahead. And this was only day two. 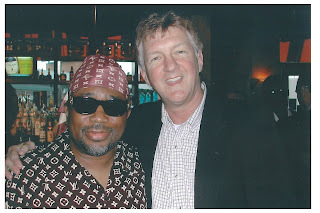 James Alexander of The Bar-Kays and Phillip Rauls share a moment for the cameras. The following week was action-packed with events that included the exclusive premier of a new film on producer Tom Dowd which included interviews with Jim Stewart and Steve Cropper. Plus there was an open panel discussion in the conference room at the STAX Academy that included noted author Peter Guralnick. Next came a tour of the STAX Museum that literally forced tears to my eyes. Then came my favorite of all events, the impromptu visits with former colleagues; Eddie Floyd, Wayne Jackson, Bettye Crutcher, William Bell, Deanie Parker, Duck Dunn, Alex Chilton, Jody Stephens, Don Nix, Larry Raspberry, Bobby Manuel, Joe Shamwell, Larry Nix and Ardent's John Fry and John King. Oh, did I mention the fantastic performance of a once-in-a-lifetime concert celebrating the grand opening of the Stax Museum? During my week while attending the grand opening of the STAX Museum, I was filled with heartfelt memories from the 60's and 70's. 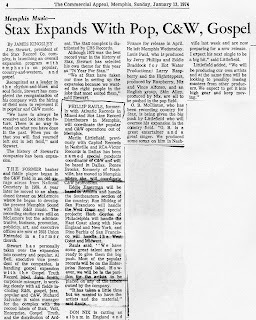 Those were the tireless days of lobbying media personnel and trying to convince disk jockeys and journalist to give equal consideration to a new STAX artist. Equal consideration was a bold term being used when a promotion person was anxious to expose the Black artists that he represented. The segregated Top Forty Music system wasn't so friendly to the Black artist's attempt to reach mass-appeal. Especially if the record didn't transmit those squeaky clean images that Pop Radio managers demanded. Even the FCC guidelines recommended avoiding records that created controversy. Plus, most newspaper and magazine subscribers, as well as their advertisers, were predominately white. Under those circumstances, a marketing person was considered lucky to obtain a favorable review or playlist addition to artists associated with that baggage. Which brings to mind, if current marketeers think it's tough to conquer mass appeal nowadays in the 21st Century, try turning back the clock five decades and approaching the media with a Stax Record. Ever had someone lower their nose and cross their arms in disgust while you were lobbying for their decision? But today's journalist and newscasters aren't interested in those formative days involving industry protocol. Prove me wrong, but it seems they're not as passionate about the nuts-and-bolts of industry mechanics and don't want to cover those battles of engagement. Seems like they just want to succumb to the simple game of the glorification of artists fanfare. That's like assuming the general public is naive and believes in the fantasy of overnight successes. My question is; Why brush aside the details of business etiquette from that era. Recollections from our past are vital elements towards our future. It's like...forget about arduous chronicles from The Battle of The Bulge, just tell us who won the war. Jim Stewart is one of the few remaining pioneers from that distinctive era. His Stax Records enabled modern music to promote equal rights for all artists. Industry figures like Jim Stewart are a vanishing breed with many of them passing in recent years. Tom Dowd, Arif Mardin and most recently, Ahmet Ertegun, have all departed the living-and now joined the spirit world in Rock & Soul Heaven. In closing, when I visited Jim Stewart at his residence during that week of the grand opening of the STAX Museum, he simply chose not to attend the function. Many misinterpreted this as a gesture of his displeasure from the original STAX closing and regarded it as bitterness. Not so quick oh ye who have failed to cover those battles of engagement. The truth is, nowadays, Jim Stewart has retired from public life and doesn't make personal appearances. Atlantic's Jerry Wexler's situation is identical whereas he doesn't attend any functions that require traveling. But here's where the story ends; During the week of the STAX Grand Opening of The Museum, while all the former STAX artists, the executive staff and former employees were taking bows, posing for the cameras and giving interviews to the national and foreign press, only former writer/artist Bettye Crutcher and myself took the time to come and visit with Jim Stewart during this historical week.